Floor to ceiling wrap around windows provide unobstructed panoramic ocean views! Our light, bright, spacious, and comfortable two bedroom-two bath Poipu Beach oceanfront vacation rental condo sits 40 feet from the ocean's edge. Floor to ceiling glass windows provide unobstructed panoramic ocean views. You can see spectacular sunsets, giant sea turtles, dolphins, and whales from the comfort of our living room and the lanai. The sounds of the ocean are relaxing - a perfect soundtrack to this paradise. Walk only 100 feet to reach one of the most famous beaches in the world to sun, snorkel, boogie board, and snooze. Travel channel ranks the beach in front of this condo as one of the premier beaches in the United States and Sunset Magazine described it as offering the best swimming and snorkeling in all of Kauai. A vacation in Hawaii doesn't get any more beautiful. We came to Kauai in 1977 fell in love with the Tropical Climate- Took one look at Kuhio Shores on the ocean and bought condos 314 and 315. Our guests have complimented both condos over the many years and have made us very proud of our oceanfront condominiums. The floor to ceiling windows provide spectacular views of the beach and ocean, where you can watch migrating whales, giant sea turtles, and surfers ride the waves. 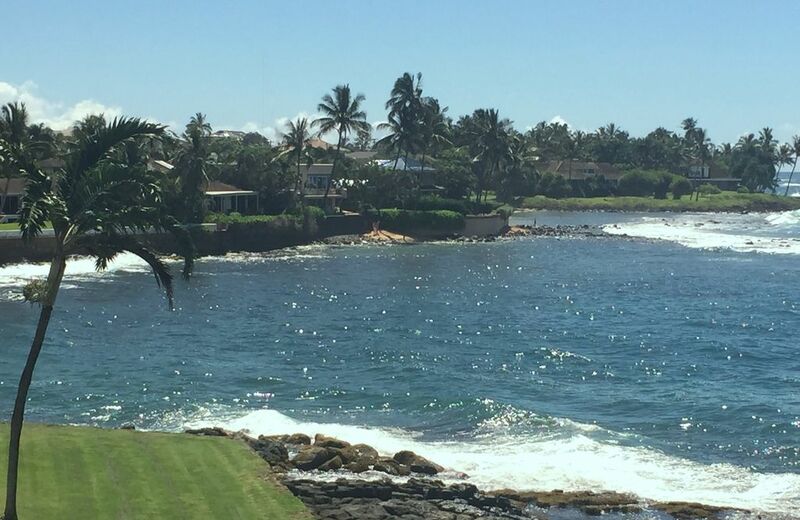 Oceanfront, renovated lodging & Poipu, Kauai beaches and views - the perfect combination for your holiday! Our trip to Kaua’i was incredible! We absolutely loved the condo. It was comfortable, clean, quiet and well equipped. Not overly fancy, but very livable and relaxed. The best part was the view and the location. This particular condo has an especially great view of the sunset. We definitely made the right choice! We saw some whales and surfers right from our lanai. Our favorite spot on the beach was on Kiahuna Beach (by the Sheraton) which was less than a 5 minute drive from the condo. We really appreciated having beach towels, cooler etc provided for us. That beach was perfect for swimming, snorkeling and boogie boarding. Going to sleep and waking up to the sound of waves was out of this world! We absolutely loved Kuhio Shores! The views were stellar, the beds were comfortable, the whole complex was super quiet and clean, and the location was convenient to just about everything. An added benefit was that we could see the New Year’s Eve fireworks on Poipu Beach from the balcony. There were turtles out front most days, and it was great to walk over and snorkel at Lawai Beach. We also enjoyed walking to Spouting Horn, Baby Beach, and the beach in front of the Sheraton. As others have mentioned, #314 is pretty dated, and the furniture inside and out is not super comfortable. Also, there is no air conditioning in the second bedroom, but if you keep the window open, it stays fairly cool in there. Jane was so helpful and easy to work with, and she made sure we knew how to get in touch with her if we had any problems. All in all, it was a wonderful visit! we really liked the location and views at Kuhio Shores, walking distance or short drive to beaches, restaurants, shops. One of the best locations on Kauai. #314 is a very clean and comfortable unit. However it is a little dated as compared to other units which have been recently updated, but otherwise it was awesome. Good location. Great views. Room 314 very dated and in need of new everything. Good location, great views. Room 314 very dated, furniture old, worn, bathrooms dated, kitchen dated but adequate. This lanai is the perfect place to enjoy your coffee in the morning and cocktails in the evening while watching the turtles swim in the water below. So peaceful. The condo is well stocked with kitchen utensils if you decide to dine in. There are beach towels, chairs, a cooler and boogie boards to take to the beach. There are laundry facilities and a barbecue. Parking is plentiful. Condo was very clean. You are within walking distance of a great snorkeling beach, as well as the Beach House restaurant. Just a short drive away are shopping centers, Spouting Horn and National Tropical Botanical Garden (beautiful). Very conveniently located to everything. Jane, the property manager, was wonderful. She responded to any inquiry we had and was very helpful. I highly recommend this wonderful condo! Beach House Restaurant Next to our condo provides accommodations for weddings and other celebrations.